Below you will find articles and reference to published and aired (TV and radio) spots talking about Cathy Lawley and Fried Mudd. Please contact Cathy for more information. Kerry Heaney from Eat, Drink + be Kerry came to a Fried Mudd workshop with six other journalists from all over Australia promoting arts in the hinterland. Click the image below to read the full article. 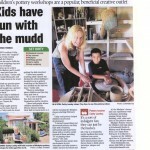 Channel 7 came to the Fried Mudd studio in Maleny to film a segment for Gardening on the Edge. Click the video below to see what went to air on Channel 7′s Local News. Click the article image to read now, or click here to read the article online at the Hinterland Times. Click the article image to read now. 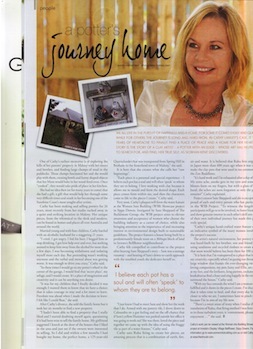 Article: Cathy describes “My experience on the day was the whole team and camera crew from Better Homes and Gardens were so friendly and very helpful Tara was particularly taken by my Hens night Out, she loves chooks! What a great day!